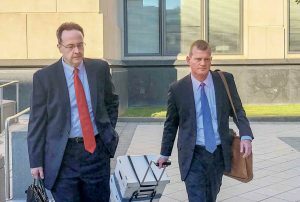 Allen Loughry, left, and attorney John Carr leave the Robert C. Byrd Courthouse in Charleston after his first full day on trial Wednesday. CHARLESTON, W.Va. — Nearly a year after reports first surfaced of extravagant spending on his office, Justice Allen Loughry got his day in court. The former chief justice of the West Virginia Supreme Court of Appeals sat Wednesday at the defendant’s table for the first day of testimony at the Robert C. Byrd United States Courthouse in Charleston. Loughry is facing a 22-count indictment, including charges of mail and wire fraud for his use of state vehicles and fuel cards for personal out-of-state trips, as well as tampering with a witness by trying to manipulate her testimony, obstruction of justice, and lying to FBI investigators.